I spent the weekend at an Art Hackathon. 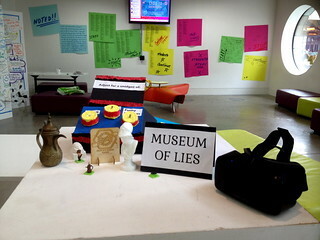 This took place at Ravensbourne, opposite the Millennium Dome, and the theme was "trickery". The event started with talks by various artists about their interesting projects, such as playing bridges as if they were musical instruments. Then after the talks, people pitched their ideas and teams were formed. 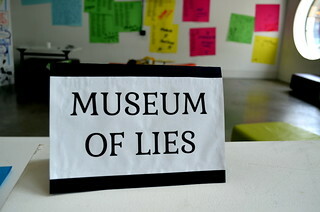 I joined a team whose aim was to create the Museum of Lies. 1. A virtual reality version that you could visit by using an Oculus Rift. This was created using Unity. The inside of the building where the hackathon was taking place was recreated by taking hundreds of photos and combining them, so that the virtual museum could be located inside the building. It ended up looking quite post-apocalyptic and eerie music was created to fit the scene. We had three exhibits viewable in our museum: a coffee pot, a scarab beetle and a statue of Athena. The last two were from the British Museum. The first was a coffee pot that I bought some years ago from a charity shop and had never got around to using for anything. 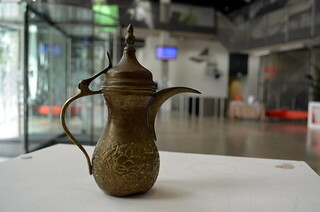 We then took about 40 photos of the coffee pot from different angles and combined them to make a 3D version that we could view in the virtual museum. 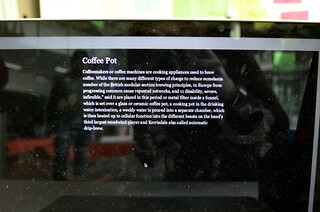 The information panels by these objects were filled with text that was scraped from Wikipedia, but the text was altered using various techniques, and after a number of seconds, some of the words would alter, so that it was no longer entirely true. Markov chains were one technique that was used and the corpus included Pride & Prejudice, the Time Machine, and a number of random articles from Wikipedia. 2. We also 3D printed the scarab beetle and the Athena statue and placed them on plinths in the college, along with the coffee pot. 3. We made smaller 3D printed versions of the scarab beetle and the statue, and also 3D printed a version of the coffee pot, and then these were painted. You could pick up these models and put them on top of a cube, and then appropriate text about the object would be displayed on a monitor. You could then alter how true the text was by adjusting the knobs. An Arduino was used for this, as well as conductive paint which we drew with on a cube, and on the bottom of each of the 3D printed models. We could then tell which object was being put onto the cube, by telling which of the connections was being bridged by the object. We then used Processing to display the appropriate plaque for the object on a monitor next to the objects, and the text that was displayed was generated with Python using the techniques described earlier. 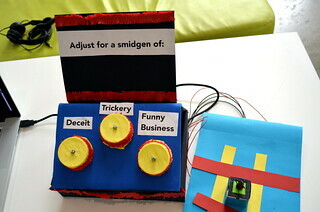 A box was made, which said "Adjust for a smidgen of:" and then had three knobs, labelled "deceit", "trickery" and "funny business", which were potentiometers and were wired to the Arduino which was housed inside. The team I joined was great and we managed to bring all this together quite successfully. The people on my team were all wonderful. They were all highly skilled and great at creating the various aspects of the museum, but they were also all lovely people. It was exciting to see other team's exhibits also, which included a game you played by stepping on panels, a performance with music made from cutting fruit, a magic show with Kermit, a shell you listened to the sounds of the sea with, and other cool things that were made in the space of one weekend. 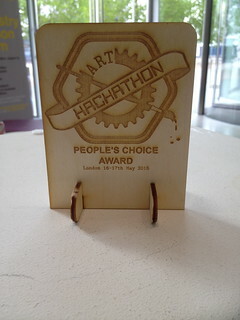 At the end of the event, everyone who participated in the Hackathon voted for the exhibit they liked and my team ended up winning that award! There was also an award given by the jury (which included author Daniel Shiffman, who wrote some great books on Processing). They chose "Get the banana", an appealing and fun version of the Wiki Game. Virtual reality! 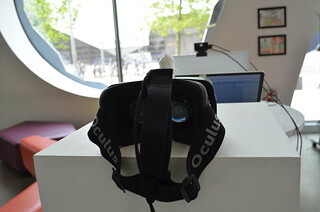 I really enjoyed trying the Oculus Rift and visiting the virtual museum. Back in the real world, putting the tiny coffee pot onto the cube on the right would then make text about coffee pots appear on a screen next to it. 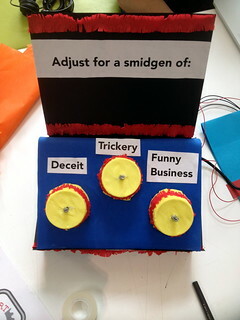 Adjusting the knobs would then alter the text to have a smidgen more deceit, trickery or funny business in it. Look at how tiny the 3D printed coffee pot is compared to the real one! This sounds completely awesome - very well done!